Sacramento Municipal Utility District was using the G5 Itron as its choice of mobile meter reader. Because of the size and weight of the device, their main issue was finding a better way of carrying the device. After evaluating the challenges SMUD was having with their meter readers, System Wear developed design requirements that the case had to meet in order to satisfy their needs. The case design needed to allow the user to carry the device hands free while walking from meter to meter. We took a pre existing design that we had done for this device (see Atco Gas Case Study) and scaled it down. We did a wrap around case with a shoulder strap attachment. 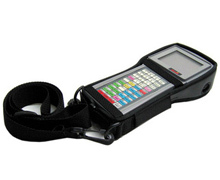 This solution is inexpensive, allows the user to carry device on a shoulder strap and provides some drop protection. Note: We have since further added an optional belt clip as well so they could choose to carry it over the shoulder or clip to their waist. These carry options make it more comfortable for the user and decrease chances of repetitive strain injuries. SMUD is located in Sacramento, California and is the sixth largest electric utility that’s owned by its customers in the USA. SMUD provides service to a population of 1.4 million people located in Sacramento County and small portions of Placer and Yolo counties.